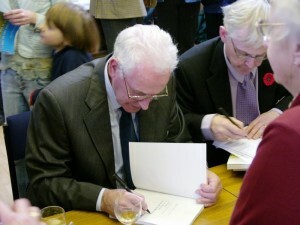 In October 2006 Waterstones came to Lismore for the launch of Donald Black’s “Sgeul No Dha As An Lios” (A Tale or two from Lismore). Donald has long been a renowned story teller; he is a stalwart of Radio nan Gailheal and a series of his stories appeared in Gaelic and English in the Oban Times. 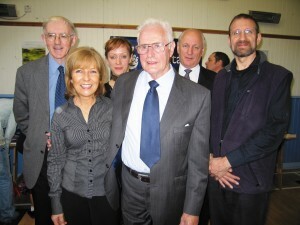 It was Jo MacDonald, a senior producer in Gaelic TV and Radio, who first suggested he go into print; she introduced him to Ian MacDonald of Gaelic Books and the idea took off. The book was Published by Cadispa at the University of Strathclyde with funds from the Heritage Lottery and Gaelic Books. 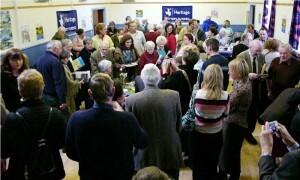 Anyone who could, came to this unique event in Lismore’s history: Liosachs and their families from far and wide, islanders and visitors. In the morning Donald read extracts to the LismorePrimary School children and Neil Horne from Waterstones Oban gave each child a book token. Later he introduced Geoff Fagin of Cadispa who was fulsome in his praise of Donald and said that this was an excellent example of the universities reaching out to sparsely populated areas with so much to offer: all at Strathclyde were very pleased to see this partnership working so well. Cadispa (Conservation and Development in Sparsely Populated Areas) is all about bringing the Donald Blacks to a wider audience and putting the Lismores on the map. Geoff thanked Norma Black for all her secretarial work, Ann MacLean for editing the Gaelic, Tom Anderson the designer, Rhona Anderson who drove the project, Tony Perkins (Cadispa’s man on Lismore) and the Hall Committee for their excellent catering. There was also a word from Iain MacDonald of Gaelic Books and Andy Anderson from Skye sang. 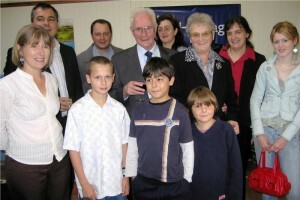 When Donald spoke it was of the great support he had had from everyone, particularly from Roma his wife as well as his extended family who were there to celebrate with him. It had been a great experience he said and he had enjoyed every minute of it. 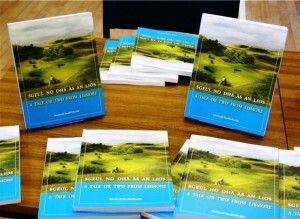 This book is available from the shop at Lismore Gaelic Heritage Centre at £14.99.